Google TV was not very successful in 2011 to say the least, Google decided to cancel Google TV appearance in some tradeshows and the Logitech Revue is now phased out, but may come back with a vengeance in 2012 as many companies showcase Google TV based solutions and products at CES 2012. I will mainly talk about the devices and hardware platforms in this post, if you want to know what’s new in Google TV 2.0 checkout “Google TV 2.0 For Android 3.1 Released“. Last week, Marvell announced it would offer the official Google TV Reference Design based on its Armada 1500 (Dual Core ARMv6/7 CPU + GC1000 GPU) “Foresight Platform” replacing Intel CE4100 used with the previous version of Google TV. If you have not seen it yet in my previous post “Marvell Armada 1500 Google TV at CES 2012“, you can watch the video at CES 2012 showing the platform in action below. 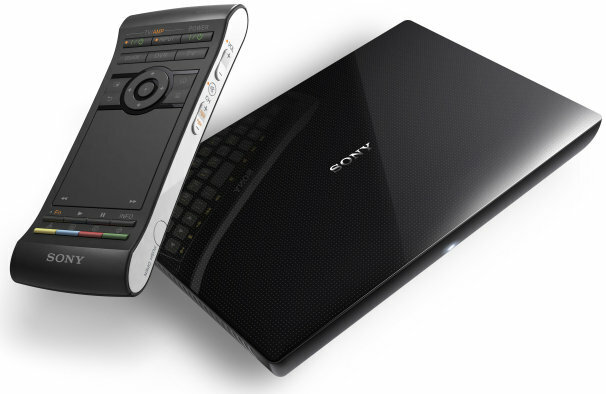 Sony announced the NSZ-GS7 Network Media Player and NSZ-GP9 Blu-ray disc player which both come with the NSG-MR7 remote control with a back-lit QWERTY keyboard on the back, a touchpad, and a three-axis motion sensor. The remote control can also be utilized as a universal remote to control connected devices such as TV, set top box and amplifiers. Sony also explain that it is compatible with some Sony Bravia TVs, so that you can use it with both the Bravia TV and the STB/Blu-ray player without having to “program” the remote with new IR codes. The NSZ-GP9 Blu-ray player is said to include voice search capabilities. Sony says both devices will be available during Summer 2012 in North America and Europe but did not close the prices yet. Vizio unveiled the VBR430 3D Blu-ray player and VAP430 Stream Player that can run Android apps and support the Chrome web browser. The device have a custom UI called Vizio Internet Apps Plus (V.I.A. Plus) to change the skin of Google TV. 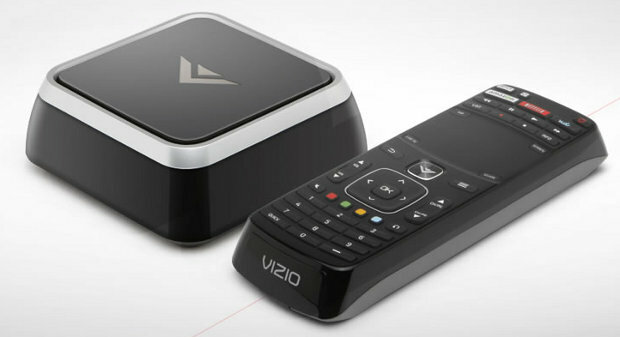 Both Vizio devices feature a touchpad-equipped universal remote with QWERTY keyboard, to control the V.I.A. Plus interface and other functions. The VAP430 allows you to connect a cable or satellite STBs via its HDMI ports. Wi-Fi is integrated to the boxes for online access. All models support 1080p resolution with 5.5ms response and come with a Bluetooth remote with a QWERTY keyboard on one side and a touchpad on the back. The TVs features 4 HDMI 1.4 inputs, 1 component input, 1 composite output , 1 RF antenna, 2 USB and a PC inputs as well as optical and stereo audio outputs. WiFi b/g/n and Bluetooth are built in. Up to four pairs of 3D glasses will be included with the TV. The Blu-ray player and media streamer will be available in 2012. No technical details or pricing were disclosed by the company. I could not find availability dates for the TVs. 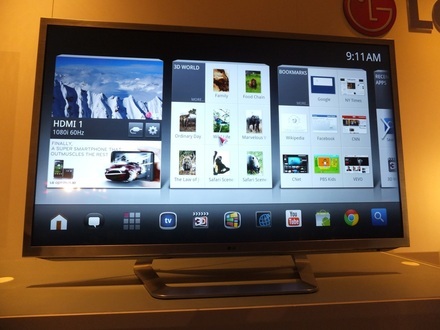 LG showcased their latest Google TV due to be released in Summer 2012 in the US and in 2013 in Europe. This TV is powered by LG L9 chipset a dual core ARM processor with a quad-core GPU, so it’s not using the Marvell solution mentioned above. As the other products, the remote control has 2 sides with one QWERTY keyboard on the back and “normal” remote keys on the front with support for motion gestures and voice recognition. To differentiate itself, LG will include its 3D Zone and K-pop Zone of 3D and Korean pop music content and potentially its own applications store with its Google TV. LG Google TV also supports CINEMA 3D technology which works with passive 3D glasses. Slightly off-Topic, LG also showcased an OLED 55″-inch TV with an amazing 4mm thickness and excellent video quality (Although it’s difficult to see on YouTube). You can see the OLED TV on YouTube Charbax channel. You can watch the video below, if you want to see how Google TV fares in the LG TV. I have probably missed some other products, and many companies are showcasing media players and set-top boxes that run Android ICS that are “Google TV” compatible such as the Always Innovation HDMI Dongle.